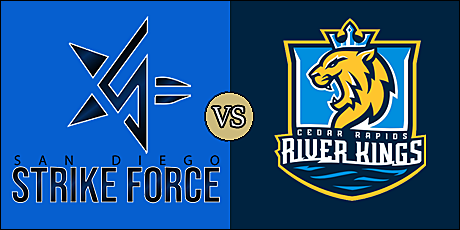 What: The Strike Force make their second trip to the midwest; this time to battle the River Kings. 2019 Head to Head: April 14 - River Kings at Strike Force. Note: This is the first-ever meeting between the teams, who are both owned by Roy Choi. The Strike Force are 0-2 overall and 0-1 on the road. 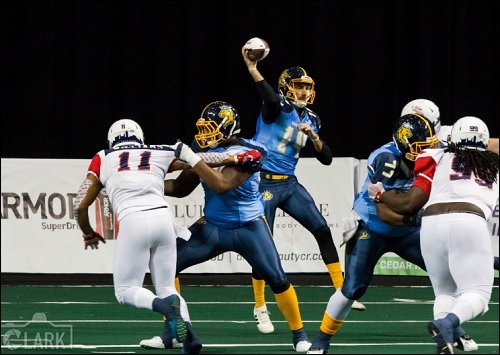 They are coming off a 65-44 home loss to the Tucson Sugar Skulls on March 3. The River Kings are 0-2 overall and 0-1 at home. They are coming off an 81-37 road loss to the Arizona Rattlers on March 3. Strike Force DL Terrence Fullum (#52). River Kings QB Kurt Palandech. Aside from having the same ownership group (and the same record coming into this game), there are few similarities between these two teams. The expansion Strike Force have struggled at times during their first two games. They fell in the opener in Moline to the Quad City Steamwheelers by 18. In their home opener, they were competitive for the most part, but were unable to close the gap while being clipped by the fellow expansion Tucson Sugar Skulls, 65-44. Burt Grossman will try to dial up some pressure on a young, but talented offense in the River Kings. 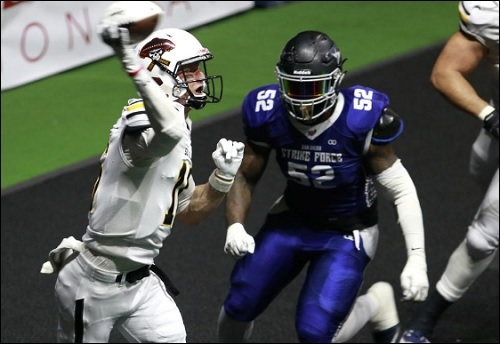 Cedar Rapids was a last-second field goal away from sending their season opener into overtime, but the Sioux Falls Storm sent them home with a field goal from Miles Bergner. The River Kings proved to be no match for the Arizona Rattlers last weekend in Phoenix. They have talent on the roster, but have been unable to come out on the winning end after their first two games of the season. Mark Stoute is looking for his first win as the head coach of the re-branded River Kings. Despite their record, the Strike Force feature some talent on their roster. Veteran quarterback Derrick Bernard is first in the IFL with nine touchdown passes and second with 212.0 passing yards per game. He is completing 55.4 percent of his passes, but has also tossed five interceptions. Bernard also has rushed for a touchdown this season. San Diego has not shown much of a rushing attack, accumulating just 14 yards in its two games. George Moreira, Jr. has rushed for 17 yards and two touchdowns, and has a receiving touchdown to his credit. Marques Rodgers has caught 13 passes for 205 yards with a pair of scores, and Julian Stafford comes in with 12 receptions for 119 yards and four touchdowns. Defensive backs Timothy Moten and Kenric Young, Jr. have 14 and 11 total tackles, respectively. Defensive lineman Terrence Fullum has the teams only sack, while defensive back Sean Potts-Harris recovered a fumble last week against the Sugar Skulls and returned it 48 yards for a touchdown. Ernesto Lacayo has converted on all 12 of his extra point attempts. Kurt Palandech's 147.0 passing yards rank fifth in the league and his five passing touchdowns are tied for fourth. He comes in having completed 64.6 percent of his passes with just a single interception. He also can be dangerous on his feet, gaining 77 yards on 13 carries with two touchdowns. Nathaniel Chavious leads the ground game with 24 carries for 108 yards and three touchdowns. Chavious also has eight catches for 52 yards. Returning starter Marquel Wade leads the team with 136 receiving yards off of 12 catches with three touchdowns. Jordan Smith is the compliment to Wade. Smith has four receptions for 53 yards and a score. Linebacker Malik Slater has recorded 12 total tackles a sack and two tackles for loss for in the River Kings' first two games. Defensive back Travonti Johnson has 10 total tackles, a tackle for loss and a pass break up. Fellow DB Ricky Johnson has two pass break-ups. The Cedar Rapids defense has yet to force a turnover. Henry Nell has made nine of 10 extra point tries and four field goals, including a league long 50-yarder last week. We will have live updates of this game, and periodic updates of the other two games; Blizzard at Barnstormers and Storm at Danger. Touchdown Strike Force. George Moreria Jr. 1 yard run. Ernesto Lacayo kick. Touchdown Cedar Rapids. Jordan Smith 6 yard pass from Kurt Plandech. Henry Nell kick. Should be noted that Ricky Johnson and Tuff Johnson of the River Kings are cousins. FT San Diego. Ernesto Lacayo 28 yards. Touchdown Cedar Rapids. Jordan Smith 14 yard pass from Kurt Plandech. Henry Nell kick. Goal line stand by the River Kings defense. They take over at their own 2 yard line. Touchdown Cedar Rapids. Marquel Wade 30 yard pass from Kurt Palandech. Henry Nell kick. Mark Stoute doesn't seem like he's in a very good mood this evening. Touchdown Cedar Rapids. Marquel Wade 8 yard run. Henry Nell kick. FG Strike Force. Ernesto Lacayo 21 yards.